BBQ has grown into one of my biggest passions. I’ve learned from the weddings I’ve BBQed for, all the seafood that’s graced my grill to my newest adventure, competition BBQ …that it is all about the equipment. I have cooked over fires, charcoal, in habachis, on $50,000 BBQs and smokers. All are great but for majority of my outdoor cooking I use gas grills. They are quick, no waiting for coals or wood to burn down to proper cooking temps. They are versatile enough to work well as a smoker. They have a large surface to cook a lot of food. Many come with rotisseries. Sometimes they have side burners, which makes for ease of cooking no running into the house to babysit any sides or sauces you have on the stove. And best of all, you can cook year round, rain or shine, sleet or snow. Living in Canada winters can be long but you can have a taste of summer anytime! Be the master of the grill…..and make the neighbors hungry. When I was asked by Char-Broil to do a BBQ review I was all over it! So this spring I have the pleasure of breaking in a new BBQ from Char-Broil. It is a gorgeous piece of equipment! I keep going to the window to admire it! I am a bit of a gear/equipment junkie and this BBQ rings all the bells. It is a nice broad BBQ with a fantastic profile! There is nothing sweeter then a spectacular stainless steel BBQ, it really is the showpiece of the backyard. 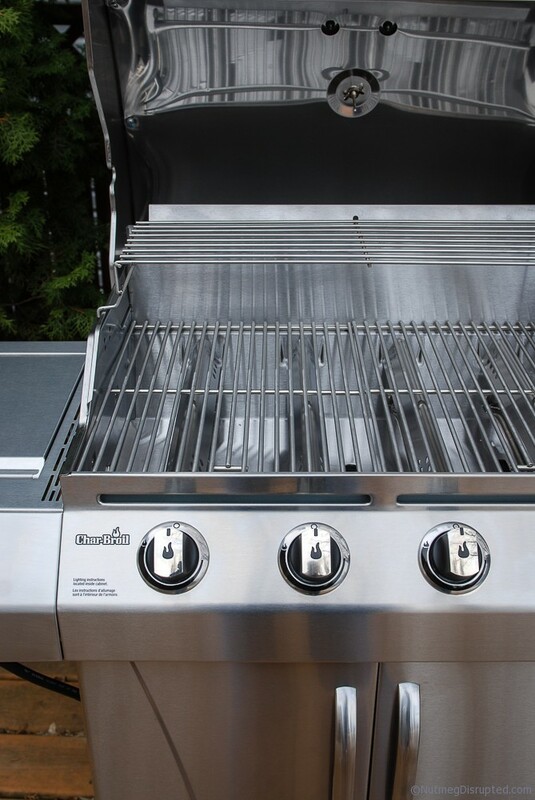 And it is not just the exterior that is fantastic; the inside of the BBQ is completely stainless steel. The BBQ has an out put of 47,000 BTUs. And enough grill space to cook an entire meal along with a side burner to do any additional cooking. There is an opening in the lid to accommodate all the gear needed for a rotisserie. If you have never used a rotisserie I highly suggest you give it a try. It will add another level to your grilling repertoire. For my first my outing on this gorgeous grill I went with something that for myself, represents spring. Shish kabobs! Right now there are amazing spring vegetables in store that are made even better when grilled. Being an Alberta girl I naturally included some fantastic marinated Alberta beef! There is ample grilling space to cook a lot of food at once. My kabobs only filled a small area of the grill. You could easily cook for 6 – 8 people at once making use of both the regular grill top and the additional shelf above it. I like that area for grilling garlic bread and to place finished product to keep warm. The side burner is a snap to turn on; just a twist of the dial and one click of the ignitor and you have immediate heat. The controls are smooth and the unit heats up quickly. It is a very solid unit that is sturdy and moves easily over any surface. Not like those monster BBQs that need 4 people to move and damage wood deck surfaces when you try and move them yourself. It is definitely one of the nicest backyard BBQs I have cooked on. Not only is it gorgeous it is a very nice BBQ to use. If you are looking to buy a new BBQ this year, I highly recommend you check out a Char-Broil grill. 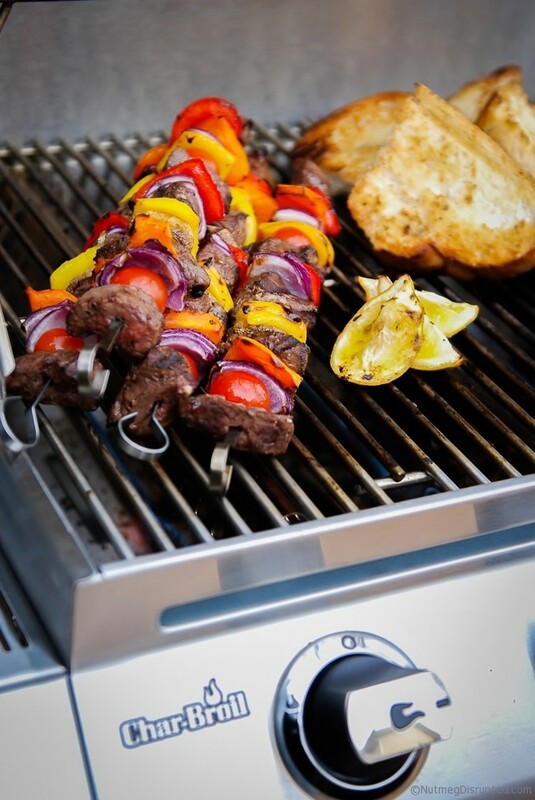 Be sure to see all the cool BBQ hints tips & recipes the #lifeisbetterbbqed team have created! We have had a fantastic time putting this all together for you! Next week I’ll be talking about my Mother’s Day menu, all grilled, including dessert! Disclosure: I collaborate with brands/products that I’m passionate about and that are a good fit within the scope of what I blog about on Nutmeg Disrupted. 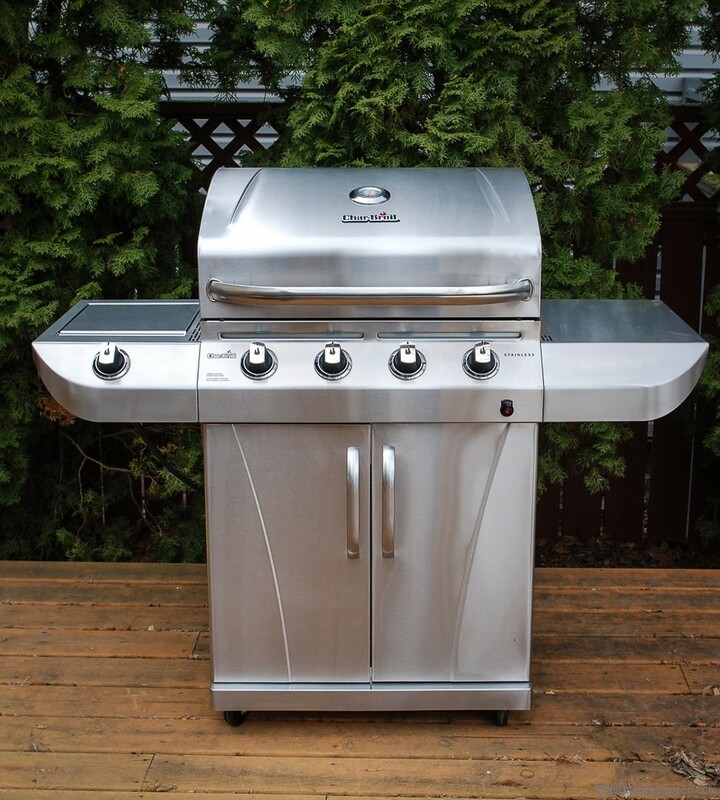 Char-Broil did supply me with the BBQ from Lowe’s written about in this review. All opinions stated above are my own.